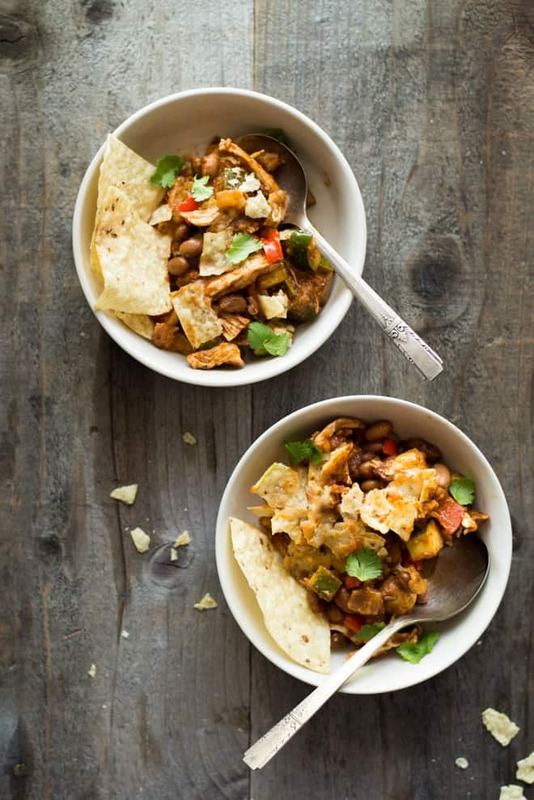 If you love chili, you have to try this chicken chili casserole. It’s filled with lean protein, lots of vegetables, and topped with crushed tortilla chips and melty pepper jack cheese. A delicious and filling budget dinner for weeknights! A friend recently told me that he eats out on most nights because it’s more expensive to cook at home. I couldn’t believe it. Instinctively, I thought his statement couldn’t be true. Cooking fresh, healthy meals at home shouldn’t be more expensive than eating out, right? For the record, I eat at home 90% of the time, and I live in California where fresh foods are readily available. I admit, I might not be the best person to judge whether eating in or out is more affordable. Anyway, his words lingered in my mind for a while, and I started thinking about the recipes that I share in this space. I’m going to make a concerted effort to share more easy, affordable meal ideas. Every week, I’ll aim to share at least one dinner recipe that costs $20 or less to make—not per serving, the entire dish. I firmly believe that you don’t have to break the bank to eat healthy, and I want to show you how. This chicken chili casserole is a great example of a budget-friendly dinner. It’s made with easy-to-find ingredients and it’s packed with flavor. Hope you enjoy it! Enchilada sauce: For this recipe, I am using my own enchilada sauce. You can definitely use any enchilada sauce that you find at the grocery store. However, I find many store-bought versions to be quite bland. If you decide to use the stuff from the stores, I recommend adding dried oregano, garlic or chili powder. Prep ahead: Prep the dish a day or two ahead by chopping up all the vegetables and cooking the chicken. Refrigerate the ingredients in an airtight container. Browning the cheese: I’m sure most of you won’t do this, but I thought it would be a good idea to stick the bake into the broiler for 10 to 15 minutes to brown the cheese. Well, the cheese turned out to be too brown (verging on burnt), forming a firm crust on the top of the casserole. In this case, it’s better to melt and brown the cheese in the oven. Substitutions: You can easily make this casserole vegetarian by substituting the meat for sweet potatoes. Another good idea would be to take out the meat and top the casserole with fried eggs! 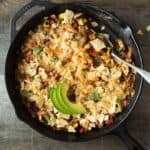 Want to see how to cook the chicken chili casserole? Here’s my video on how to make the dish! Poach Chicken: Chop chicken breasts into smaller segments. I usually cut a chicken breast in half, along the grain. Bring about 2 quarts of water to boil. Make sure to salt the water with 1 teaspoon of salt. Add chicken breasts and cook for 8 to 12 minutes, until the water runs clear and the meat reaches 165ºF (74ºC). Dish up chicken. Once the chicken is cool enough to handle, shred it with your hands. Heat the olive oil in a large, oven-safe skillet over medium-high heat. Add onions and cook for about 2 to 3 minutes, until the onions start to soften. Add diced zucchini, peppers and a pinch of salt and cook for 3 to 4 minutes. 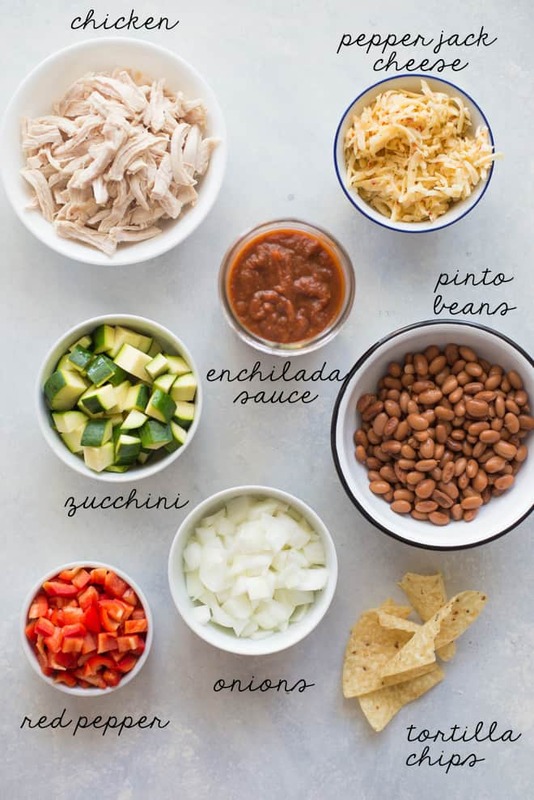 Add chicken, beans and enchilada sauce, and stir until everything is combined. Turn off heat. Sprinkle tortilla chips on top, then sprinkle the cheese. Feel free to add more cheese or tortilla chips. Place skillet in the oven for 10 to 13 minutes, until the cheese is bubbly and slightly browned. Serve casserole with cilantro or avocado, if you like. 1. 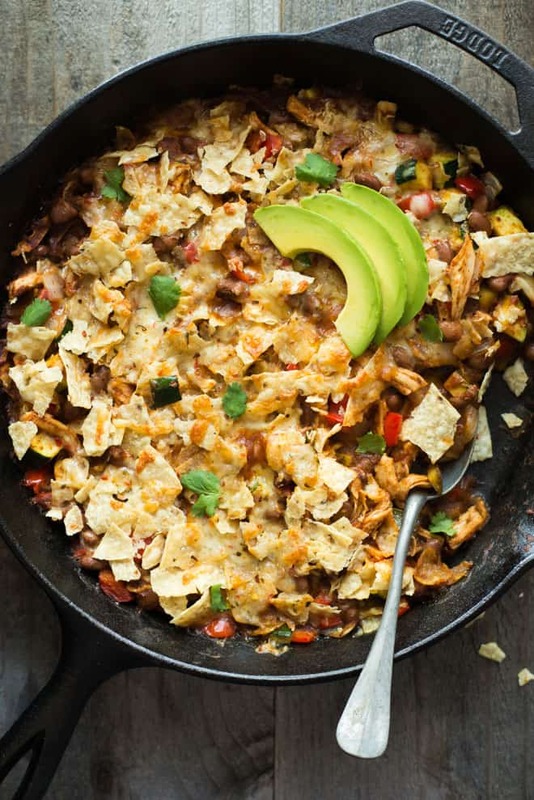 If you don’t have an oven-safe skillet, you can pour the chicken, beans, and vegetables into a baking dish first before topping everything with tortilla chips and cheese. The baking time should be the same. 2. 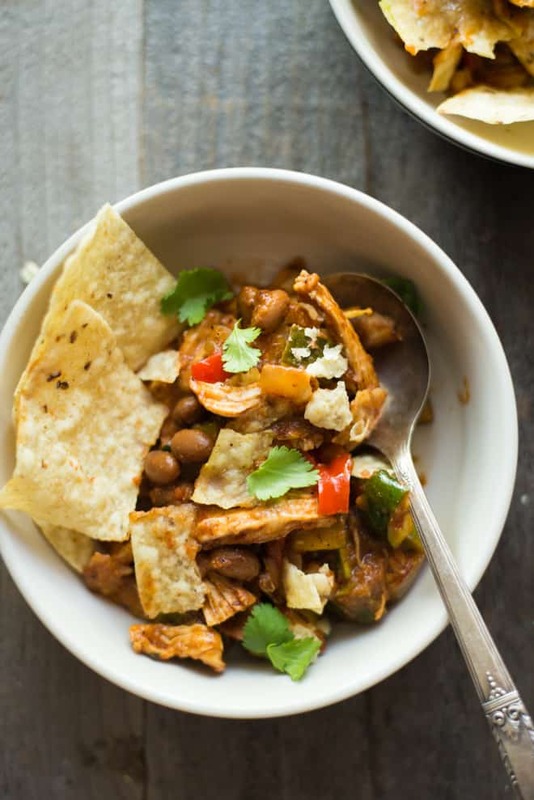 This recipe can be easily replaced with any cheese, beans or vegetables you have on hand. A Quick Note: This post contains affiliate links, which means that I earn a small commission if you decide to purchase a product after clicking the link. Buying products through affiliate links is an easy way to support your favorite bloggers at no additional cost to you. Thank you very much for your support! Uh, YUM! This is the perfect transition into full on chili season and I could not be more excited! Looks amazing! Thanks for trying it out, Deborah! This recipe works well with any beans, so feel free to use whatever you have on hand! This was delicious! I made it exactly as written tonight and we loved it! We are looking forward to leftovers tomorrow….yummy! This dish was absolutely delicious! The recipe is easy to follow for beginners in the kitchen, and it is budget friendly. It’s just a bonus how tasty it is! Eva, thank you so much for trying out the recipe! So glad you enjoyed it!! Super easy and tastes even better as left overs. It also tastes amazing without the chips. I do like to add only about 3/4 cup green enchilada sauce vice 1 1/2 cups red enchilada sauce so it is less wet and mixes up flavor. Glad you enjoyed it, Ashley!! Thanks for your cooking notes! Great recipe! It is a new favorite that boyfriend requests often, and he usually hates anything with too many vegetables! I’ve been experimenting with alternate versions. I added a can of black beans to the mix as well as the pinto beans. I also cut the chicken into much smaller strips so the poaching time was only around 5 minutes instead of 8-12. I also scrapped putting it in the oven entirely! I left all the ingredients on medium to medium-high heat in a large pot for about 10-15 minutes and it came out just as well! It’s a little more soupy like traditional chili. Adding flour or cornstarch helped thicken it a bit. Then I add the cheese on top of the chili in individual serving bowls. Super yummy! So glad I found this easy recipe! Rachael, I’m so glad that you and your boyfriend enjoyed this recipe! Thank you so much for leaving a comment!